Inquiring into Dōgen’s fascicle of our Spring Ango study, “Refrain from Unwholesome Action,” this Fusatsu talk explores the first pure precept of refraining from harmful action, and atonement as letting it all in. 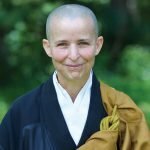 Concluding her Face-to-face Creative Expression retreat, Hojin Sensei looks to Master Dogen’s instructions on “washing the face” as a way in to going beyond concepts of pure or impure, and to ask us to really question the depth and nature of our turning toward full acceptance of all that is especially in regards to our unique human embodiment. Starting with the story of Master Zhaozhou Congshen’s encounter with an old woman, Hojin examines fear and dread, its omnipresence in the life of the Buddha and our own lives, and the importance of allowing oneself to truly experience fear. 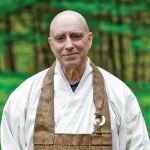 Hojin Sensei, in a talk given during a renewal of vows ceremony, speaks about six forms of reverence: training, heedfulness, hospitality, and reverence for the buddha, dharma, and sangha. Hojin Sensei uses the life and enlightenment poems of Mugai Nyodai Daiosho, the first female Zen master in Japan, to explore keeping it together and falling apart in practice. 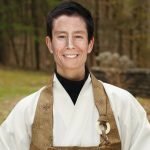 At the conclusion to this year’s Wild Grasses Sesshin, a meditation intensive for those who identify as women, Hojin Sensei and Zuisei Sensei investigate the roles we assign our ancestors, both personal and spiritual. Are we making the best use of them? Are they making the best use of us? Hojin Sensei leads a large study group through an introduction and overview to the Therigatha, a collection of poems by early female monastics and practitioners, many of whom were students of the Buddha himself. Hojin Sensei ends the discussion by chanting one of the poems. This talk was given at the opening of the current ango training period.